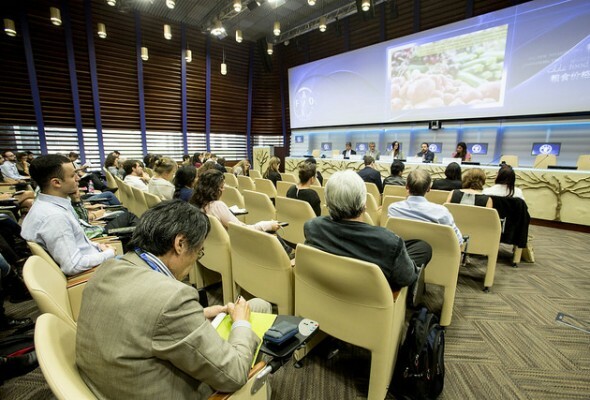 The Watch 2015 was launched at FAO Headquarters, unveiling key findings around nutrition and the impact of business operations on food policies. Welcoming its release, representatives from civil society, social movements and the UN came together to exchange views about current approaches to nutrition. With malnutrition affecting more than 2 billion people and obesity rates rising, the Right to Food and Nutrition Watch 2015 underscores the artificial separation of nutrition and sustainable food systems, which is resulting in vertical, technical and product-based solutions that ignore human determinants. Pointing to the influence of corporations on policy-making processes, authors throughout the publication warn there exists a medicalization and commercialization of nutrition that is putting people’s sovereignty and rights at great risk. Speaking at the launch of ‘Peoples’ Nutrition Is Not a Business’, Society for International Development Managing Director Stefano Prato, explained that the current logic behind the hegemonic global food system is leading to the homogenization of diets, based on ultra-processed food, and is having a dire impact on agrobiodiversity and local food systems. In addition, Prato expressed concerns over the increasing corporatization of agriculture, “driven by a perverse business model which is disrupting livelihoods and promoting new forms of malnutrition”. “We reject this model and offer an alternative. The approach to nutrition should be human rights-based, particularly emphasising women’s and girls’ rights, and also centered on a local and agroecology model of agriculture,” he said. The Watch 2015 also touches upon the rapidly growing and proliferating multilateral trade agreements that grant rights to corporations instead of people. In its conclusions, the publication highlights these pacts are negotiated with little or no public transparency. By the same token, it underlines that the 1994 Agreement on Agriculture (AoA), renegotiated during the Doha Development Rounds, obstructs peoples’ food and nutrition sovereignty, and disregards the views and realities of developing countries. Commenting on the AoA, UN Assistant Director General and Coordinator for Economic and Social Development, Dr. Jomo Kwame Sundaram, echoed the views presented in this year’s Watch and stressed the importance of reflecting on why developing countries do not have space in these discussions. [This approach] threatens food security in developing countries,” he stated. The Right to Food and Nutrition Watch is the product of collaboration between the Watch Consortium and the Global Network for the Right to Food and Nutrition (RtAFN), both of which comprise over 20 civil society organisations and social movements. Each year, the Watch comprises the most recent debates on the RtAFN, giving visibility to peoples’ struggles for food sovereignty and also to conceptual discussions to demand states to comply with their obligation to respect; protect and fulfill human rights.